The “Sad Clown with the Golden Voice” is here with his heartfelt anthems and a suitcase full of Kleenex! This Pity Party is not all sadness and longing. The show is peppered with a brilliant sense of the absurd, mixing lots of humor with the awkward, tender moments. A veritable “Pagliacci by way of Pee-Wee Herman and David Lynch” (The AJC), Puddles Pity Party has 305k fans on Facebook and over 120 million views on YouTube for indelible interpretations of classics by ABBA, Bowie, Cheap Trick and Queen and his unforgettable mash-up of “Pinball Wizard/Folsom Prison Blues”. You may recognize him from his recent appearances on America’s Got Talent and viral video collaborations with Postmodern Jukebox. 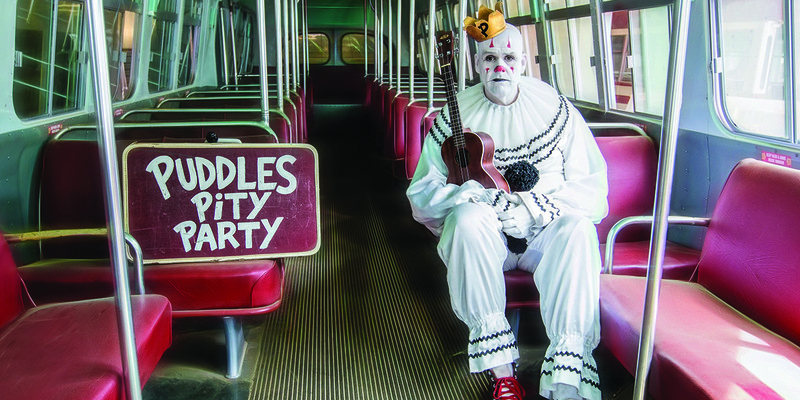 Puddles has toured extensively in the US at legendary venues like the Palace of Fine Arts in San Francisco, the Kennedy Center in D.C. and the Troubadour in Los Angeles. He has also performed many times in the UK at Soho Theatre London and the Edinburgh Fringe Festival. Other worldwide festival appearances include the Adelaide Fringe Festival, Perth Fringe World, Melbourne International Comedy Fest, Just for Laughs Montreal, Belgium’s Gent Festival, Festival Supreme (LA), Bumbershoot Festival (Seattle), Moontower Comedy Festival (Austin), and Bethlehem’s MusikFest. Tickets are $55 or $40, depending on location. A $3 theatre facility fee will be added to each ticket. Prices include sales tax.